marriages involved a spouse testing period. There was no stigma attached to multiple marriages and divorces. One aspect of Japanese culture that many feel is under assault is the nuclear family. Japanese divorce rates were fairly low until recently, but there is still a huge stigma surrounding divorcees that parallels American attitudes of the past. Japan in 1970 saw 95,000 divorces, in 1996 206,955 with the rate levelling off in 2000 to around 250,000 divorces a year. This works out to about 25%, about half the rate of present day America. Some feel that with the increasing divorce rate in Japan that the nuclear family concept is breaking down. This is especially true of the retiree divorces whose rate is skyrocketing as Japanese wives wait for their husbands to retire and then divorce them to avoid having to spend all day with a man they barely know and who used to spend 18hrs a day at work. But what are traditional Japanese attitudes towards marriage? 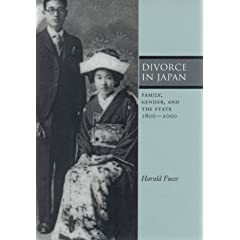 Some critics point to the American meddling in Japanese family law after the war as the reason divorce rates have risen but Fuess disagrees, arguing that divorce procedures “have shown a conspicuous continuity over the past few centuries in the marginal role played by courts in divorce.” The Japanese have always had a “mutual consent divorce” system. 90% of divorces never see the inside of a court and are just registered at city hall. So while pundits point at the American system as the problem, there is no problem as Japan is just returning to the traditional values of trial marriages it enjoyed for hundreds of years before Japan began to experiment with Western style values. A bit off topic yet still in the arena….The “traditional” japanese school uniforms, particularly the ones worn by boys. The black slacks and top with the button up collar with brass buttons. I have heard many a conservative Japanese person, young and old lament this uniform being “forgotten”. It is odd then when I have to explain that this uniform was actually adopted by the Japanese 100 plus years ago from the Prussian empire. The “work hard even at the expense of your family life” ethic is also one that many Japanese would probably be surprised to find to be not particularly traditional too. In fact you would probably be morally condemned pre-Meiji Japan if you neglected your family well-being for the well-being of an institution such as the state, or corporation. So what are the divorce and marriage laws like if say…. a married American moves there (Japan/Nippon/Nihon, amybe hokkaido island) leaving his wife in America (who hates him anyway) and he tries to marry a Japanese woman? Is the other (American) marriage considered null because its outside of the country (Japan)? Does the other (American) marriage become voided because he is marrying a Japanese citizen (and gaining resident not citizen status. Wish you could gain citizen status)? or does he have to divorce first? If so is that (to divorce his American spouse) easier once he is in Japan? To get married in Japan you need a form from your embassy saying your not married in America. But all they do at the embassy is make you swear an oath you’re not married. So if you’re comfortable with lying under oath to both the American and Japanese government you can get married in Japan. If you get married to a Japanese citizen you get a spousal VISA that you have to renew every three years. It allows you to work in Japan but you’re at the mercy of the Japanese spouse. That said Japan is littered with jilted men who fell in love with some idealized Japanese girl, married them and then found out they are totally different people than who they thought they were. This leads to unhappy marriages where you’re totally isolated in a foreign country and then you become one of those crazy Gaijin. Not really comfortable lying under oath. Life doesn’t always give a person choices though, so it is good to be prepared. If one learns about all the options then one knows whats happening when they get forced into a stiuation they would rather avoid and can make the most of it. From the sounds of it divorce stateside before the move is the best option, unless anyone can tell me what its like trying to complete a divorce once one has moved to Japan? I have studied and still study everything I can about Japanese psychology, especially the psychology of its women. So yes I have looked into Gaijin/Japanese marriages that go wrong and why. I have read about the way a Japanese woman behaves while dating, then once serious about marriage and finally once married. People behave differently during each of these stages and have different expectations of the one they are with during each stage. Japanese people are not completely alien and as people too have many of the same basics. Cultural differences can cause strain and have to be taken into acount of course. It is Japan’s cultural differences that draw me to the place and make me feel more comfortable. Asian cultures in general make more sense to me and Japan’s makes the most sense. The psychological differences caused by this culture are also of great interest to me (I enjoy studying psychology for fun in my spare time). I wrote a report on Hikiko-mori and was rather surprised to find out they are not the docile, tame, and inocent-emo-kids that we get told they are by the manga and anime that makes it here to the states. From what I have studied of Gaijin/Japanese marriages you can sometimes get a resident visa, but a citizenship is out of the question. Children if produced get to choose citizen-ship as they come of age. Also it looks as though dual citizen ship is out of the question. Of course this is all based on the word of Gaijin who married a Japanese woman, or man and then posted about it on the internet. The majority of what I read did not turn out well, due to unrealistic expectations, cultural differences and as you mentioned thinking their spouse was someone different than they really were. No way you can get a Permanent Resident VISA right away (resident visa). Everyone has to get the spousal VISA first and then after 10 years you can get the Permanent Resident, less years if you have kids. Re-reading this, I have to contest the conclusion. The past is the past and it’s gone. We can’t return to it because as it disappeared, we changed. So returning to the past and expecting the outcomes to be what they were doesn’t work out. So, at this point, with this group of Japanese people, an increasing divorce rate likely could be a problem. It is likely tied, in some way, to the decreasing birth rate as well.